Do you have knee pain, or does your knee feel unstable? According to Lindsay Weston, PT, DPT, a leading cause of knee pain and instability is weakness of the hamstrings. “At Body Gears Physical Therapy, we use techniques to turn on these weak muscles and then teach you how to do exercises to maintain this activation and to strengthen the hamstrings,” explained Weston. In the U.S. 95,000 people suffer from Anterior Cruciate Ligament (ACL) injuries every year; they are more common in women than men. ACL injuries occur from injuries typically involving: twisting the knee with the foot planted, extending (straightening) the knee too far, jumping and landing on a flexed (bent) knee, or stopping suddenly when running. Injuries are often described as a “popping” or “snapping,” sudden pain and swelling to the anterior knee, and the inability to weight-bear through a ‘loose’ knee. There are many ways to treat ACL injuries from easy things like rest and ice, to effective physical therapy, as well as surgical options if needed. However, the best way to avoid injury, pain and surgery is prevention! Facilitation of the lateral hamstring muscles protect the knee from ACL injury. Physical therapists at Body Gears are trained to facilitate and activate specific muscle groups and specific muscle fibers that improve knee stability. Facilitating the weak muscle fibers of the hamstrings creates a coordinated effort of the thigh muscles when the leg is in use. 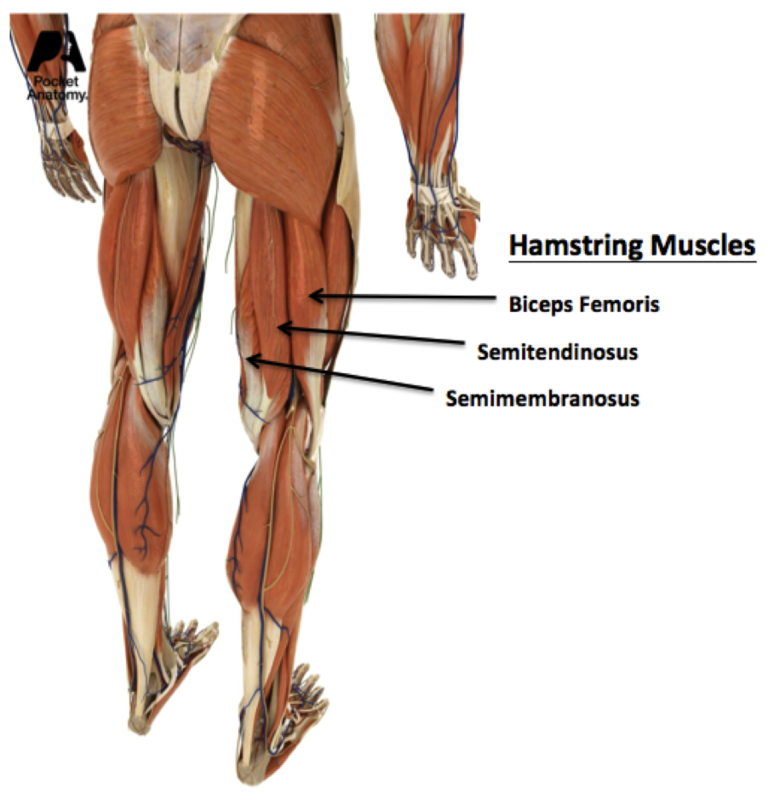 The hamstrings consist of three muscles located on the back of the thigh: the semitendinosus, semimembranosus, and biceps femoris. Activation of the biceps femoris is more effective at reducing stress on the ACL than activation of the semitendinosus and semimembranosus muscles when bending the knee.1,2 Using the biceps femoris muscle decreases knee twisting and shearing during activities. This co-contraction of all three muscles reduces the risk of tearing the ACL for athletes and for other active individuals. Pictured below is one technique that physical therapists at Body Gears use to improve biceps femoris activation for knee stability. This technique uses Proprioceptive Neuromuscular Facilitation (PNF) diagonal patterns of the lower extremity to incorporate activation of the biceps femoris muscle into functional movement. Ask your physical therapist about using this technique during your treatment. If you’re struggling with knee pain or if you are interested in learning how to strengthen your hamstrings and prevent injury, click here to find the Body Gears closest to your home or office. We look forward to serving you and we welcome your questions, comments and inquiries. 877-709-1090. Biscarini A, Botti F, Pettorossi V. Selective contribution of each hamstring muscle to anterior cruciate ligament protection and tibiofemoral joint stability in leg-extension exercise: a simulation study. European Journal of Applied Physiology. 2013;113(9):2263-2273. doi:10.1007/s00421-013-2656-1. Guelich D, Xu D, Koh J, Nuber G, Zhang L. Different roles of the medial and lateral hamstrings in unloading the anterior cruciate ligament. The Knee. 2015. doi:10.1016/j.knee.2015.07.007. [Epub ahead of print].